It’s time to cook dinner and the oven doesn’t work. What do you do? Call Just Appliance Repairs for range, wall oven, cook top and microwave repair & maintenance in Port Orange, New Smyrna Beach, Edgewater, Oak Hill, Mims Titusville, Port St John, Cocoa, Merritt Island, Rockledge, Cocoa Beach, and Cape Canaveral. Ordering take-out pizza is one option. Or taking a drive down to the local fast-food restaurant may work out for you. 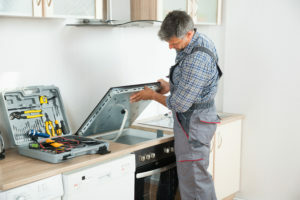 These are good short-term solutions but you’ll need us to get your appliances back in working order for the long-term. If you’ve noticed any of the above problems or have another complaint about your ovens, stoves, range or microwave’s performance, call the repair professionals at Just Appliance Repairs today. We also service glass tops and range hoods. We are trained and experienced with oven, cook top, and range diagnostics and repairs. We use nothing less than the industry’s best tools and state-of-the-art techniques to provide you with cooking repair services. Timely oven, stove, and range repair can help you maintain a safe environment, free of fire hazards, gas leaks, and other conditions that could compromise safety. You’ll be able to reliably make meals without overcooking- or undercooking them. If you have questions regarding anything about how your cooking appliances are performing, call us today. Servicing Port Orange, New Smyrna Beach, Edgewater, Oak Hill, Mims Titusville, Port St John, Cocoa, Merritt Island, Rockledge, Cocoa Beach, and Cape Canaveral.